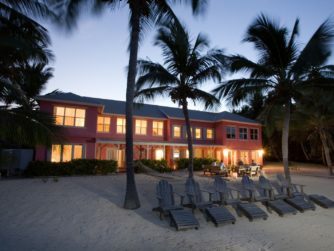 Bair’s Lodge on South Andros Island offers deluxe ocean-side lodgings in an attractive plantation-style building surrounded by palm trees. The bright, airy lodge is nestled on a sparkling white sand beach. Stretch out and relax on the verandah. Enjoy a cocktail from the fully stocked bar. And take in the laidback South Andros scene. Our unpretentious and air-conditioned living room and dining room areas have comfortable sofas, plenty of reading material, and face the ocean. Here you will find your buffet breakfast laid out each morning. The lodge has a main bar fully stocked with spirits, cold beers, soft drinks, plenty of ice, a blender and mixers for cocktails. Satellite television has been installed for those who wish to catch up on news or sports during cocktail hour. Wi-Fi is available at the lodge. Our shop is stocked with bonefishing essentials: lines, leaders, tippet and an excellent fly selection. We also carry sun protection and Bair’s Lodge logo’ed merchandise. Two of the six rooms in the house open to a long veranda facing the ocean, furnished with comfortable benches and tables to sip coffee in the morning or cocktails in the evening. There are rod racks beside the outdoor showers, and we have a hose with fresh water to wash down your tackle. From the veranda you can walk to the beach, where the skiffs are moored. We also have comfortable lounge chairs and hammocks for relaxing outdoors. 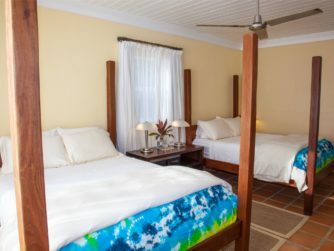 All of our beautiful bedrooms have terracotta tile flooring, white cotton sheets, as well as tropical-weight duvets and plenty of down pillows. Spacious rooms have A/C, as well as universal outlets for recharging phones, computers, etc. En-suite bathrooms and full baths are standard, hot water is plentiful, and towels and laundry bags are provided in all bedrooms. Delicious indigenous and international dishes are our specialty. 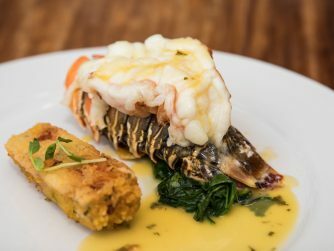 Menus are crafted from fresh ingredients such as local produce and fish (mahi, tuna, grouper, and snapper), conch and lobster. We carefully stock our larder with high-quality foods from the U.S. and Nassau. Our chefs bake bread, pastries and cookies daily. And our coffee is made from freshly ground beans at the crack of dawn for all you early risers. A full breakfast will always feature a variety of cereals, coffee and a selection of teas, as well as fresh fruits. Eggs will be cooked to your preference, with bacon, sausages and grits. Hot cereals are also available to order. A lunch menu card allows you to choose next day’s lunch and the contents of the boat coolers. On your return from fishing you will find cold beers, spirits, and a blender for cocktails, as well as stacks of soft drinks. 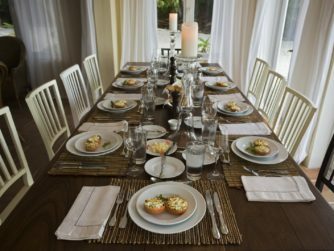 Delicious appetizers are served on the veranda, so you can sample local specialties such as cracked conch, grouper fingers and conch salad. If you have a specific preferred brand of liquor, please be sure to let us know in advance so the lodge can have it ready for you upon arrival (payable upon arrival to the lodge). Otherwise, you can bring your own bottle. A good range of local spirits will be available free of charge at the lodge. Dinner starts with appetizers such as homemade soups or conch ceviche. 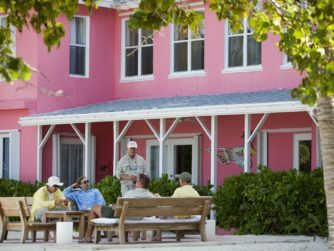 Our emphasis is on mixing local dishes with light fresh recipes such as snapper with mango salsa, and some barbecued fish . Desserts will vary from chocolate decadence to key lime parfaits. 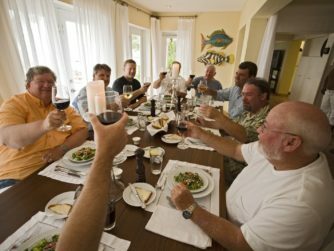 House wines such as Malbecs from Argentina, Chilean Chardonnay, Sauvignon Blanc, Merlot and Cabernet Sauvignon will be served with dinner. After dinner, liquors will be served in the sitting room. 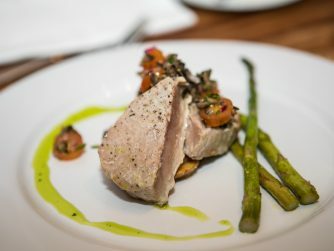 We can happily cater to special dietary needs. When you complete your pre-trip questionnaire please mention any requirements or food allergies you might have, so we can inform the chef. Salads are offered in our cooler lunches for those on low-carbohydrate diets. The lodge has a good supply of drinking water from our reverse osmosis system. You will find water in your bedroom and your boat, and you can drink the tap water. In our arid climate, conservation is always appreciated.